Sooo I heard you’ve been a very good girl, eating clean, staying active and all? Woohoo, go you! But let’s be honest, sometimes a girl just wanna have fun and eat out, right?! It’s true that cooking allows you to control exactly what goes on your plate but spending time out with friends, discovering new places and new flavors is just as important. Just because you’re “healthy” doesn’t mean you should live in a cave and forget about your social life (even if your friends are not into healthy eating at all). Good news, baby: you can definitely go out without ruining your efforts of the week and feeling guilty. It’s all about making the right choices, and I’m here to help you. Salads can be the devil in disguise because of the dressing. Always ask for the dressing on the side so you can decide to use only a portion of it or not at all. Try to avoid desserts altogether. I know this is not what you want to hear but unless it’s fresh fruit, it’s most likely way too high in sugar and fat. If you really really want one, share it with your friends. If you’re not familiar with a dish, try to find out how it’s made (google the recipe or ask the waitress). Anything fried, heavy in fats, sugars and carb loaded should raise a red flag. Save it on your phone and next time you’re going out, check the list and enjoy your guilt-free night!! 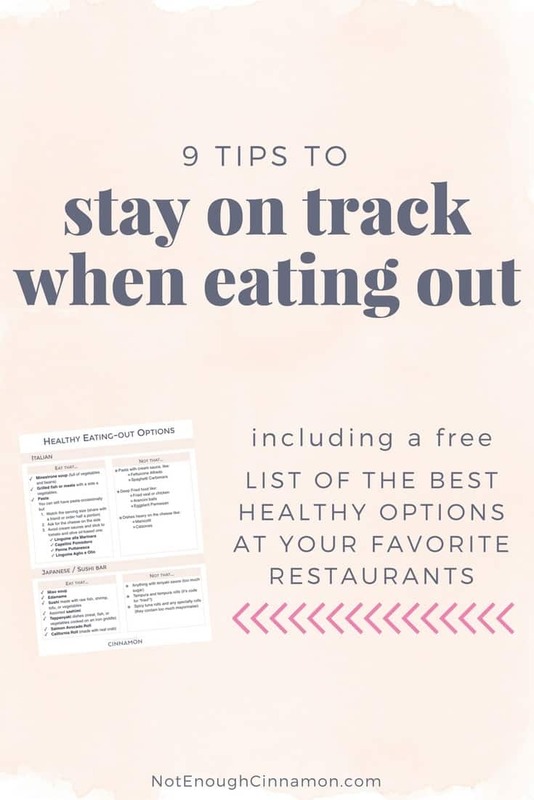 Some great tips in this post and I think it’s great you have put a guide together to outline the best foods to choose because it so easy to pick the wrong option and blow your diet. If I am trying to stay on track and have to eat out I like to eat a small snack before I go out (usually protein or fiber based) to take the edge off my hunger and stop me overdoing it.